There are only a few NBA players in the center position that has the ability to dish assists in a basketball game. There are dominant centers like Dwight Howard and Chris Bosh than can score and rebound but doesn’t distribute the ball well. Pau Gasol is one of the elite centers in the NBA and is very useful in an NBA fantasy team because of his passing skills. He averages a double-double and can even have at least 4 assists per game. In an NBA player review you often see players at the center position being discussed. Most of the time, it is a point guard or a shooting guard that is featured or talked about. That is why it important to have a quality center in your fantasy roster. You will rely on your PG, SG and SF to give you good number is both offensive and defensive statistics but if you have a quality center, it will be an easy win for you. As you can see in his statistics, he is active both offensively and defensively. From October 27, 2010 to November 21, 2010, he had a single digit in rebounds for only 3 times. And in 11 games he had a double-double in points and in rebounds. A player review of an NBA player is for the good of fantasy games. 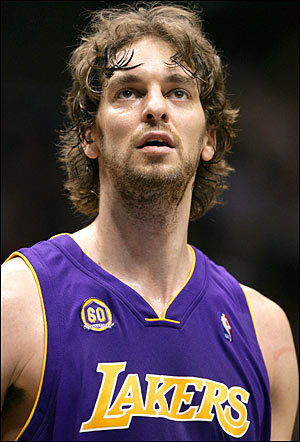 That is why Gasol is highly recommended as one of your centers for your roster. There is no doubt that his statistics will not change until the end of the 2010 – 11 season. He has been healthy the whole start of the season. He may miss a couple of games but in general he is worth it. He is the strongest rebounder in Los Angeles Lakers and when it comes to assists, they have good finishers’ in Lakers like Kobe Bryant, where he can pass to. He is their main man when it comes to defense, and in the offensive side he is their post up player. So don’t expect that his statistics will go down or even change. With the new franchise player of the New York Knicks, their team made a good start for the 2010 – 2011 season. But the team won’t be that successful without a good court general. And they’ve done that with the help of their point guard Raymond Felton. In this NBA fantasy player review he was not ranked nor listed as one of the suggest picks in the start of the season. It is important for an NBA fantasy player to at least excel in 3 statistics to help a team. This point guard didn’t only do that but he excelled in 5 statistics with quality numbers. He was never this productive in the past seasons that is why it is a surprise for the New York Knicks this season. When it comes to consistency, there is no doubt that he is very consistent. 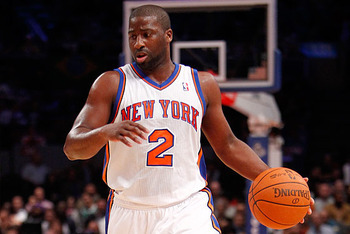 Maybe the addition of Stoudamire it allowed Raymond Felton to have more space when it comes to the offensive side. He made it into this NBA fantasy player review because of 2 things, three points made and steals per game. He averages almost 2 three pointers made per game and also 2 steals per game which is really great for a NBA fantasy team. Here is a quick preview of the latest NBA statistics average of Felton. In their game against the Los Angeles Clippers last Saturday (November 20, 2010) he listed 20 points, 7 assists, 7 steals and 1 blocked shot. This made him an all around player which is really good for a fantasy team. There are only a few players who make the NBA fantasy review since it is not often that a player would dominate in the court like this. An NBA fantasy game is a team game but it is also important for a player to excel in individual stats to make it easier for team owners to drop and add players. You are actually looking at a future Jason Kidd with the mix of Derrick Rose. He can score he can dish an assist and he can rebound. He has the athleticism like Derrick Rose that is why he is an effective slasher. His athleticism also allows him to dish more assists since he can drive the defense away from other players. 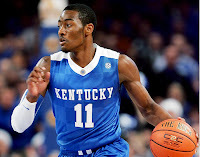 Washington Wizards is really lucky to get him at the first pick in the first round of the 2010 NBA draft pick. John Wall as a basketball fantasy player is really excellent. He can help you out in points, assists, steals and even rebounds. He is only in his rookie year so you will see a lot more from him in the NBA and in player review articles. The only problem for him right now is his health because he have been pushing his body to the limit. John Wall was listed in the injured list (Day to Day) last November 16, 2010. He already missed 3 games so far and that is a big loss for NBA Fantasy players. To know what you are losing from him, this is his stats from October 27, 2010 to November 13, 2010. He is one of the best Point Guards in the NBA and in player reviews today, almost averaging a double-double in his first season. He also contributes 3.3 steals per game which is a big loss for a basketball fantasy team. When it comes to a fantasy team it is easier to find a substitute for an offensive player but it is hard to find one for a defensive player. He is not yet healthy to get back on the floor so he will be missing some games this week. Hopefully, when he would be listed again in the Washington Wizards line-up he would maintain a healthy body. It may affect his stats but because of his young legs, his stats won’t go down that much. Expect him to have a good final stats this 2010 – 11 season. Since the game of NBA Fantasy is all about winning all the statistics, a good and effective way to win is by dominating. In a custom setting of a Basketball fantasy game there are 8 default statistics that you should win and those are Free throw percentage, Field Goal percentage, Points, Rebounds, Assists, Three Pointers Made, Steals and Blocks. If you can dominate 5 out of 8 statistics you can easily win the game. Now how can you do that? There are players that can dominate in free throw percentage, assists, points and three points made. All you have to do is at least acquire 5 players that can dominate in these statistics. This is one of the best NBA fantasy strategies since you don’t have to monitor each player that you have in your roster. The only difficult thing in this fantasy strategy is the availability of players. But if you really want to win, you will have to sacrifice some of your players just to get these players. 105 points per game, 30 rebounds per game, 19 assists per game, 6 three points made per game and a free throw percentage of at least 87 percent per game. This is only their average per game and a player would play at least 3 – 4 games per week. Not only that, you will have 8 other players that will contribute to the statistics.